For many homeowners, a bathroom renovation will usually top the list of remodels that they hope to complete. Because these rooms are so frequently used, they often will be the first to show obvious signs of wear and tear over time. If you are ready to invest in improving your home, here are some of the benefits of bathroom renovations in Tulsa. 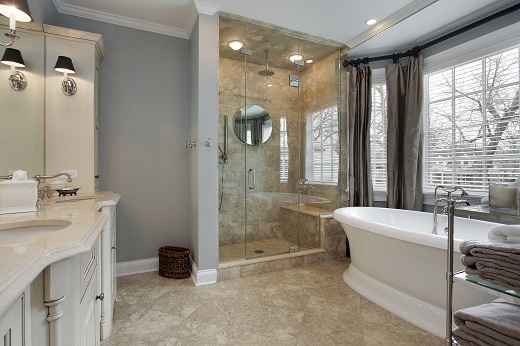 A bathroom renovation is one of the easiest ways to dramatically increase the value of your home quickly. By replacing outdated sinks, toilets or tubs with modern, energy-efficient options, most homeowners will see the value of their home rise by over $2000. This not only makes a house much easier to sell, it provides a higher return on investment than most home improvement projects. In most dated bathrooms, homeowners will often want a renovation to provide more storage or expand the usable space within the room. A bathroom renovation allows the homeowner to work with a contract to open up the room and add modern amenities that can be placed strategically for the most impact and smallest footprint. Don’t settle for a bathroom that feels small, expand your space and storage with a bathroom renovation! Water conservation has become a hot topic in recent years and many homeowners are starting to realize how much water actually gets used in their bathrooms. Fortunately, many modern bathroom fixtures, including toilets and bathtubs, not only look great, they provide superior energy efficiency and water conservation features that were previously unavailable. If you are still struggling with your dated fixtures, the innovations provided by these industries are now available to take your bathroom into the modern age. Why Timco Construction for Bathroom Renovations in Tulsa?